Historical linguistics — the study of language change — has long been a cornerstone of linguistics. With its long history, multiple subfields, and complex terminology, it presents many challenges to students and scholars. This book is an essential supplement to courses in historical linguistics and the history of individual languages. 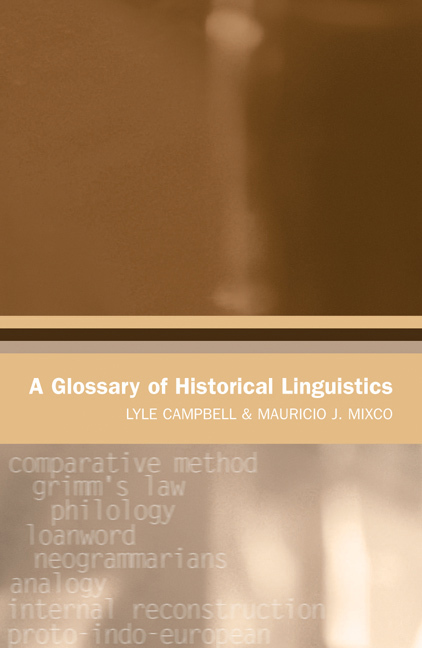 It provides an accessible, up-to-date, and widely representative overview of historical linguistics through explication of its main terms and concepts. Lyle Campbell is professor of linguistics and Latin American studies and director of the Center For American Indian Languages at the University of Utah. He has twice won the Linguistics’ Society of America's Leonard Bloomfield Book Award. Mauricio J. Mixco is a professor of linguistics at the University of Utah. He publishes on the Yuman, Mandan, and Shoshoni languages.